After a break of over a week, Pakistan will take the field once again in this World Cup on Sunday, which will be the start of a crucial week for Misbah-ul-Haq's side, one that will decide its fate. In a period of seven days from March 1 to March 7, Pakistan will play against Zimbabwe, UAE, and South Africa. After two big losses, Pakistan could not have asked for a better schedule. The matches against Zimbabwe and UAE are ideal for Pakistan to find some form and rhythm and finally open their account. However it will be no easy ride given the way Zimbabwe and UAE have so far performed in the World Cup. The coaches of both the sides, Dav Whatmore and Aaqib Javed respectively, are well versed with the strengths and weaknesses of Pakistan; therefore, one can expect Zimbabwe and UAE to be more prepared for Pakistan than they have been for other teams. Pakistan will also have to contend with Ireland on March 15, in their last group game. The first round exit at the 2007 World Cup, courtesy the Irish, will play on Misbah's mind for sure. Pakistan's players and fans, though, need to also take inspiration from the past. Their record against the likes of Bangladesh, Zimbabwe, and associate nations in World Cup matches has been largely horror-free. Since 1996, Pakistan have played 12 matches against these countries and have lost only twice. The key to Pakistan's success against Bangladesh, Zimbabwe, and the associates has been their bowlers' dominance. While Pakistan have typically batted well in these matches, always posting a total in excess of 250 (except for two instances), it has always been their bowling that has enabled them to dominate the relatively weaker teams in World Cups. Here are some interesting statistics for these matches, barring the two games that Pakistan lost to Bangladesh in 1999 and Ireland in 2007. 167 The highest score by an associate nation in a World Cup match against Pakistan. 130 The average score for associate nations in World Cup matches against Pakistan. 151 The highest score by Zimbabwe in a World Cup match against Pakistan. 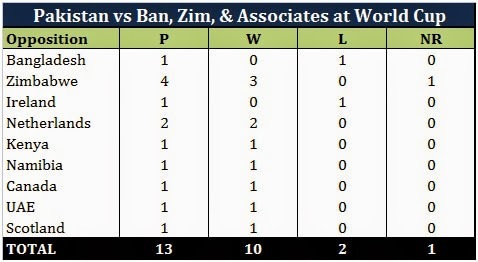 130 The average score for Zimbabwe in World Cup matches against Pakistan. 3 The number of wins Pakistan has against Zimbabwe in as many completed matches in World Cups. There is no doubt that bowling is going to be the key for Pakistan in their upcoming matches against Zimbabwe, UAE, and Ireland. The attack has conceded over 300 runs in both their World Cup matches and they will have to improve significantly starting this Sunday. We have already discussed how this is Pakistan's most inexperienced pace attack ever in a World Cup, but Mohammad Irfan, Sohail Khan, and Wahab Riaz have looked good in bursts. They will just need to sustain their performance over the duration of 50 overs. Shahid Afridi, who was supposed to be Pakistan's strike bowler, has struggled and he will definitely need to pick himself up and be the potent force with the ball that he has been in the past. In hindsight, it was a mistake leaving Yasir Shah out against the West Indies, considering the damage Imran Tahir caused against them. He must play in Pakistan's remaining games as he can undoubtedly be the key with the ball against teams who will most certainly struggle against quality leg spin bowling. Pakistan have dominated Zimbabwe and associate nations in World Cups thus far, and there is no reason why they can't repeat the dose. The players can get on to the field on Sunday with some degree of confidence knowing that the Zimbabweans have never beaten them in a World Cup match. They should look to seek momentum with good wins over Zimbabwe and the UAE, which they can then take into the all important encounter against South Africa.